The change in plume brightness during this observation is due almost entirely to the changing sun-Enceladus-spacecraft angle, or phase angle. Over the course of the observation, the phase angle changed from 149 to 155 degrees. Tiny water ice particles make up the bulk of the plume as imaged by Cassini's cameras. These particles tend to scatter light toward the viewer much more at higher phase angles than lower ones. Imaging scientists process such images to remove variations in brightness due to the changing phase angle in order to study the plume's true variation in brightness. Observing how the brightness of the plume varies throughout the icy moon's orbit can help scientists understand the nature of the mechanisms that force material to Enceladus' surface. The variability in brightness of the background is due partly to Cassini observing Enceladus through Saturn's E-ring and partly due to the changing phase angle. The frames with a brighter background were taken when the line of sight through the E ring was greater than in the frames with a darker background. These views look toward the leading hemisphere of Enceladus. North on the icy moon is up. The images were taken in visible light with the Cassini spacecraft narrow-angle camera on May 10, 2015. 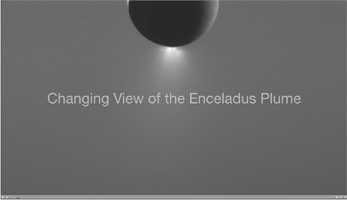 The views were acquired at distance of approximately 220,000 miles (350,000 kilometers) from Enceladus. Image scale is about 1 mile (2 kilometers) per pixel.